The aqueous solution is inserted in an electrical circuit comprising a battery and a bulb that lights when electric current flows and therefore when the aqueous solution is conductive. - It is necessary to use a vessel containing the tested solution. 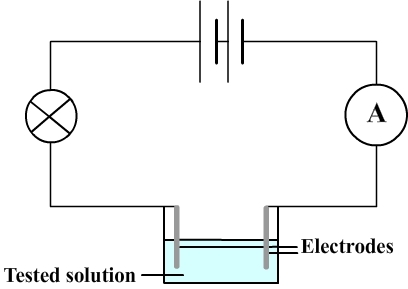 This solution is connected to the rest of the circuit using metal rods that are immersed (these rods are called electrodes). - The bulb does not light up if the current is too low and it can't detect them. To detect low currents an ammeter is therefore also inserted in the circuit. - Distilled water, tap water and sugar water for which the electric current is very low (in general it is considered that distilled water is an insulator). - The salt water and the solution of copper sulfate for which the current is much higher, which indicates they are good conductors of electricity. An electric current is consists of electrically charged particles in motion: it can then be concluded that distilled water, tap water and sugar water contain few particles of this kind. - Pure water contains almost only water molecules which are electrically neutral. - Tap water contains molecules of water and mineral salts. - Sugar water contains water molecules, molecules of sugar (sucrose molecules) and mineral salts. It can be deduced that sugar water and the solution of copper sulfate are conductive because they contain electrically charged particles. These particles are called ions. Comment: The sugar water and tap water are not completely insulative because of their mineral salts that are composed of ions. Distilled water is not totally insulated as it is not perfectly pure: it may contain, ions from the atmospheric gases that are dissolved.